Growing wheatgrass in your own home doesn't have to be complicated! With the Wheatgrass Growing Kit by Handy Pantry you can quickly set up a growing station in your own kitchen that delivers fresh grown wheatgrass whenever you want it. The Wheatgrass Growing Kit by Handy Pantry is compact, very affordable, and comes with all the information and supplies needed to grow wheatgrass at home. 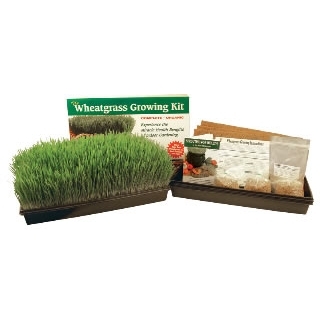 It isn't difficult to grow your own wheatgrass and once you get your growing station set up you simply wait until your fresh grass is ready to be harvested and consumed. Weigh the cost of purchasing fresh wheatgrass already grown to the cost of the Wheatgrass Growing Kit by Handy Pantry and you will find that growing your own from seed is the most affordable way to go. Comes with everything you need to grow wheatgrass at home. Comes with detailed booklet about wheatgrass and your health. 3 - 10x20 Plastic Growing Trays. 3 Cocotek Hydroponic Wheat Grass Mats. 1 Supply of Azomite Trace Mineral Fertilizer. 3 Lbs of Organic Wheat Grass Seed. 1 Booklet - Sprouting For Health In the New Millennium.